Edwin Hang is well-known for his work on Skullkickers and most recently Sonic the Hedgehog and Mega Man for Archie Comics. As the saying goes though, there's no rest for the wicked and now Huang is lending his talents to Street Fighter Unlimited, serving as the new lead artist on the series. Edwin’s art will be headlining the series for four issues, starting with Street Fighter Unlimited #5. This issue sees Ryu, desperate to control the dark forces within him, seeking out a new master - the ancient hermit Oro! Plus, in a special bonus story illustrated by Jeffrey “Chamba” Cruz, Oro is paid a visit by another student of the Ansatsuken martial arts – the deadly Akuma! Street Fighter Unlimited #5 features two standard covers by Gonzalo “Genzoman” Ordóñez Arias and Jeffrey “Chamba” Cruz, as well as two special incentive variants. Joe Vriens provides the CVR C homage variant, which calls back to a classic 1990s comic event, while Steve “Kandoken” Mack provides a Street Fighter™ V variant featuring the game’s fierce new Brazilian fighter – Laura Matsuda. Comic book specialty retailers everywhere are now taking pre-orders for Street Fighter Unlimited #5. 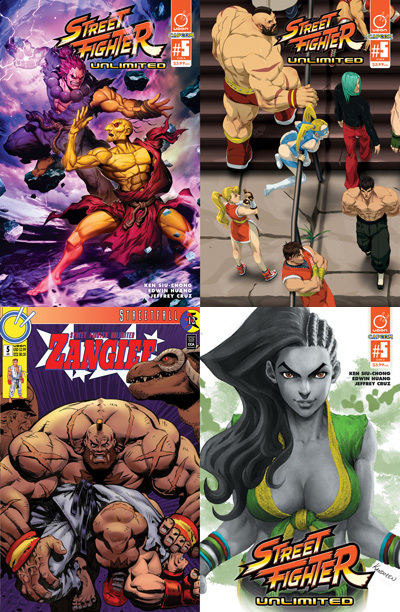 Toronto, ON – JAN 28, 2015 – UDON is proud to welcome Edwin Huang as the new lead artist on the monthly STREET FIGHTER™ UNLIMITED comic series! Edwin is well known as the penciler for the fan-favorite Image Comics series Skullkickers and recently wrapped up a successful stint on Archie Comics’ Sonic the Hedgehog andMega Man™ comics. Edwin is also the designer of Pop Culture Shock Toys’ upcoming line of Street Fighter™ V 1/6 scale statues. Edwin’s art will be headlining the series for four issues, starting with STREET FIGHTER™ UNLIMITED #5. This issue sees Ryu, desperate to control the dark forces within him, seeking out a new master - the ancient hermit Oro! Plus, in a special bonus story illustrated by Jeffrey “Chamba” Cruz, Oro is paid a visit by another student of the Ansatsuken martial arts – the deadly Akuma! UDON’s creative services division is dedicated to providing high-quality artwork to the entertainment industry, in the form of sequential art, character designs, packaging artwork, style guides, illustration, and graphic design. Our clients include Marvel Comics, DC Comics, Capcom, Nintendo, Disney, Legendary Pictures, Warner Brothers, Mattel, Hasbro, and many other partners in the fields of film, television, comic books, toys, and video games. Edwin Your awesomeness humbles me!